This stela represents the god Mahakala, the personification of an Siva converted to Buddhism. A black-skinned deity, he is identifiable by his third eye, his diadem decorated with skulls, and, on the top of his head, the figure of the Jina Aksobhya, chief of his lineage. His waist is girded with a tiger skin and a garland of fifty severed, bleeding heads. In his hands he holds a cleaver and a skull cup (kapala) full of blood, as well as the magic staff placed horizontally between the crooks of his elbows. 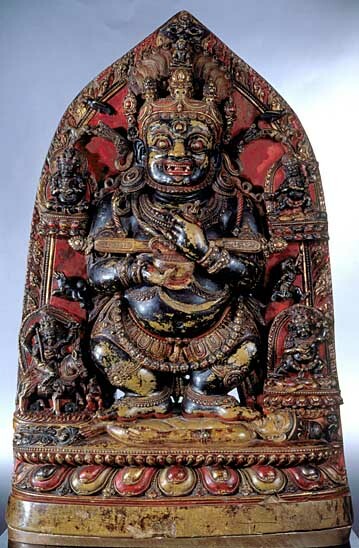 A black bird, a black dog, a black jackal, and a black man usually accompany this Mahakala. Here he appears in his manifestation as Gur-gyi mgon-po, “The Protector of the Tent”, portrayed squatting in the midst of a mass grave of his defeated enemies’ bodies. On the back of the stela is a historical inscription (rare in Tibet) specifying the donor’s name as A-tsa bag-shi and recording 1292 as the date of creation. The sculpture was carved in greenish beige limestone with a compact, consistent, and very fine grain. It bears witness to the widespread Tibetan cult of Mahakala which was to develop in a variety of very different ways. It was perhaps the work of an expatriate Newar craftsman from Kathmandu in Nepal and displays the marked Nepalese influence found in Tibetan art at that period. Dating from the predominance of the Mongol Yuan dynasty in Asia, this piece is a reminder that Tibetan Lamaism was the official religion of the Yuan Empire. Indeed, the donor, A-tsa bag-shi, was assistant to Phags-pa (1235-1280), nephew of the Yuan Emperor Kublai Khan (1215-1294) who had placed him in charge of religious affairs.